Cold-Weather Science: Embrace Winter With Your Own Outdoor Laboratory | Seasonal Activities | Kids VT - small people, big ideas! When temperatures plummet and winter winds howl, it's tempting to hunker down indoors. But outdoor play in any season provides health benefits. A 2017 research report, coauthored by the University of Vermont nursing faculty for the Rutland-based nonprofit Come Alive Outside, points to many positive correlations between physical activity in nature and children's academic performance and emotional well-being, year-round. And frosty air, sparkling icicles and piles of snow provide the perfect setting for both play and scientific discovery. 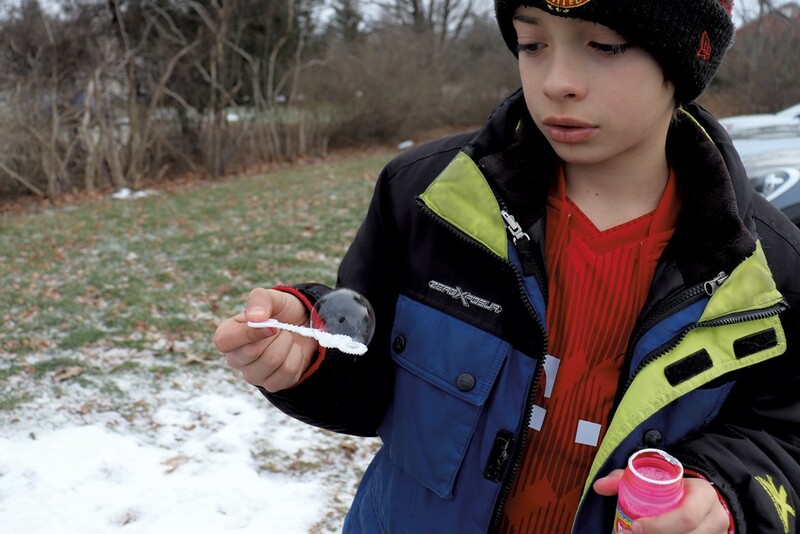 My 10-year-old son, Zac, and I took advantage of recent cold days to try a few outdoor science experiments. We conducted some at home and some at Mad River Glen, with help from an onsite naturalist. "Snow, ice and cold weather offer unique opportunities to explore science concepts you don't get in other seasons," said Cory Stephenson, who guides Mad River Glen's snowshoe treks. "It also teaches grit and perseverance. You may not be 100% comfortable outside in winter, but that doesn't mean you can't enjoy yourself and have fun." We did! Check out four of our cool experiments. What materials make good insulation on cold days? With Stephenson's guidance, we filled three Mason jars with piping hot water from a teapot, making sure that each jar held the same volume. Stephenson presented several insulation options. Zac and two other boys chose bubble wrap for one jar and a down hat for another. We left the third jar unwrapped to serve as a control. We measured the water temperature with a thermometer and also felt it with our hands. Zac made a chart listing the insulating materials and starting temperatures and left space to fill in ending temperatures and change in temperatures. We placed the jars outside in the snow and left for two hours to snowshoe. Upon our return, the sample wrapped in down still felt too hot to touch, while the bubble-wrapped sample felt lukewarm, and the unwrapped control was icy cold. Stephenson explained that down feathers' fluffy structure creates pockets of air. The trapped air insulates birds and people — and Mason jars — preventing heat from escaping. Blowing bubbles in any weather demonstrates scientific concepts, including elasticity and surface tension. Bubbles blown in very cold air form icy globes with beautiful crystalline patterns. We tried making ice bubbles twice with store-bought bubble solution. On a 22-degree evening, only our largest bubbles froze, and it took a few minutes for the ice to harden. We had better results on a 10-degree day. The bubbles froze faster and stayed frozen longer. When they popped, they looked like shards of glass. We discovered that the trick is to blow slowly, creating large spheres, and try to land them on a cold stone patio or walkway rather than the warmer ground. Chemical reactions occur when two things combine to make something new. Mixing baking soda and vinegar creates carbon dioxide gas that spews like a volcano. Adding soap and food coloring creates vibrant, foamy "magma." We used an empty one-liter plastic seltzer bottle, two spoonfuls of baking soda, one spoonful of liquid dish soap, several drops of red food coloring and about 12 ounces of white vinegar. We mounded snow into a volcano shape around the bottle. Zac poured everything except the vinegar into the bottle. 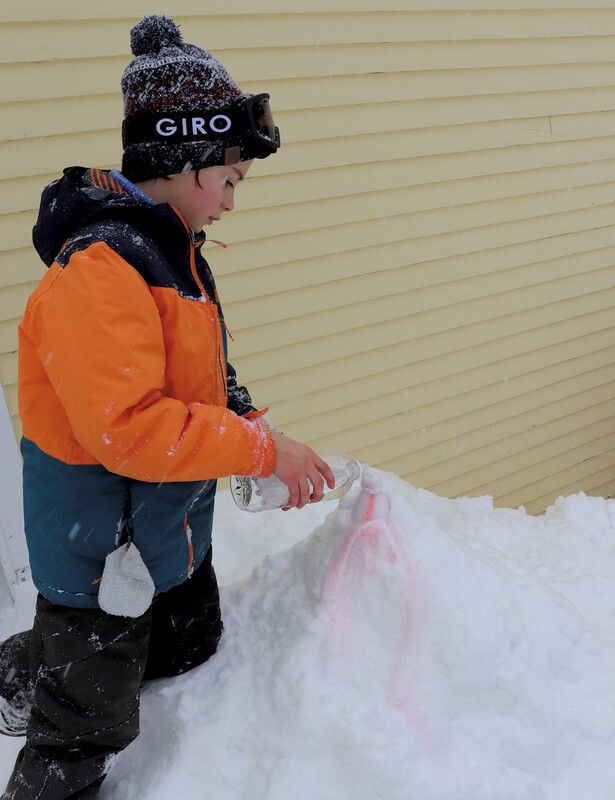 When he added the vinegar, the volcano "erupted," with bubbly red lava pouring over the snow. Caution: Vinegar can sting eyes, so supervise young children. This experiment provided a tasty lesson in thermodynamics and nucleation, the process that occurs when matter changes from one form to another, such as when liquid becomes solid. When you cool liquid slowly, it lowers its freezing point to below 32 degrees (the temperature at which water usually freezes). When that liquid is then agitated, by shaking or pouring it, it can start a chain reaction in which ice crystals form. It took several tries to get this experiment to work, so I recommend starting with a small bottle of seltzer or soda. We found success on a 4-degree morning with a one-liter bottle of lemon-lime seltzer. We started by vigorously shaking the never-opened bottle of seltzer to increase the pressure inside the bottle. We set the bottle in snow for about four hours, until we could just barely see some ice forming inside the bottle, but the seltzer remained mostly liquid. We carefully unscrewed the cap, poured the seltzer into a freezer-chilled glass, and, in seconds, ice formed before our eyes! To help the reaction along, we stirred the seltzer with a spoon, then enjoyed a refreshing, citrus slushy. Get outdoors with the Mad River Glen Naturalist Programs, tailored to participants' interest in ecology and wildlife. Join a staff naturalist for a 1.5-2 hour guided snowshoe trek, every Saturday and Sunday at 10:30 a.m., through the end of March. $25 for adults, $15 for kids 12 and under, $65 for a family of four. Snowshoes available to rent for $5. Register at the ski school desk in the Basebox Lodge.